TPP ministers agree on "core elements" of new trade pact minus U.S. The ministers of the remaining signatories to the Trans-Pacific Partnership after the withdrawal of the United States said Saturday they have agreed on "core elements" of a new trade pact to be implemented without Washington, though failing to have their leaders endorse it. "The success of negotiations has shown the high level of consensus for trade and economic development," said Vietnam's Industry and Trade Minister Tran Tuan Anh at a joint press conference with Japanese TPP minister Toshimitsu Motegi, who co-chaired recent rounds of ministerial meetings between the 11 remaining member states. Motegi said the new agreement "sends a very strong message to the United States and other countries in the Asia-Pacific region." The new pact, called the Comprehensive and Progressive Agreement for the Trans-Pacific Partnership, has revised the original TPP text so that it can come into force 60 days after at least six signatories complete domestic procedures. In coming to the agreement, the 11 countries reached a consensus on suspending 20 clauses in the original text if Washington stays out of the pact, including 11 on intellectual property. The ministers made the announcement after a last-minute objection by Canada complicated the process, leading Japan and Vietnam to reconvene a ministerial meeting late Friday to reconfirm the "agreement in principle" that the Japanese minister announced on Thursday. Japan had hoped that the leaders of the TPP countries would back the deal on the sidelines of the two-day Asia-Pacific Economic Cooperation forum summit through Saturday in the Vietnamese coastal city of Danang, but Canada's unexpected move led to the cancellation of the leaders' meeting set for Friday afternoon. 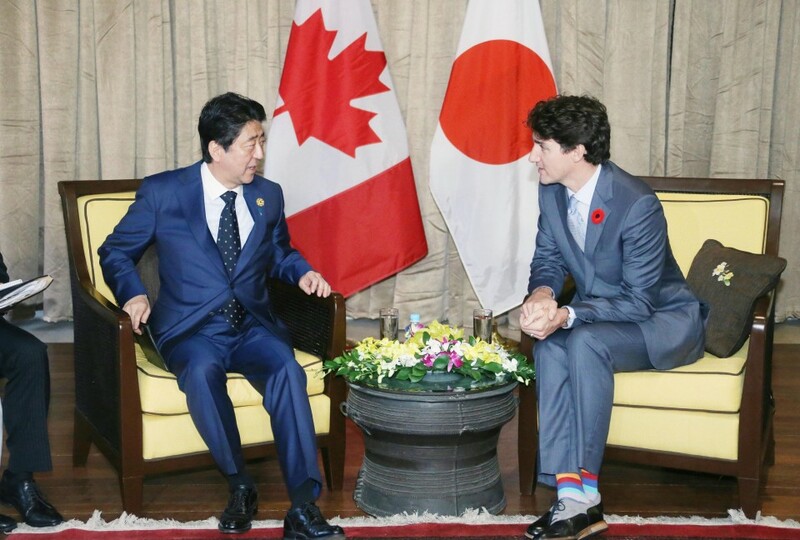 Canadian Prime Minister Justin Trudeau did not show up at the venue of the meeting after holding talks with Japanese Prime Minister Shinzo Abe on Friday. Abe said Canada "was not at a stage to confirm the agreement" reached at the ministerial level. A negotiation source said Canada seemed to have claimed that it has not yet agreed on rules on intellectual property as well as those on trade in the auto industry. Ottawa was also dissatisfied with the way Japan had chaired the TPP meetings, the source said. After U.S. President Donald Trump pulled the world's biggest economy from the TPP in January, Japan had been eager to clinch an accord at the APEC summit, with the remaining 11 signatories sharing the goal of an early implementation of the pact. The 11 TPP countries are Australia, Brunei, Canada, Chile, Japan, Malaysia, Mexico, New Zealand, Peru, Singapore and Vietnam. Including the United States, the Pacific Rim trade pact would cover around 40 percent of the global economy. Excluding the United States, the 11-party TPP's share of world gross domestic product drops to 13 percent, but trade experts say the deal would still create a free trade area with high-standard market liberalization. The pullout of the United States came as a shock to the other 11 members, given that the Pacific Rim deal was a landmark pillar of Trump's predecessor Barack Obama's policy of a strategic rebalance, or "pivot," to the Asia-Pacific region and had significance not only economically but in security aspects amid the rise of China.